The club normally introduces water polo to swimmers of about 8 or 9 years of age in the form of “mini-polo”; the only criteria being the ability to swim confidently. 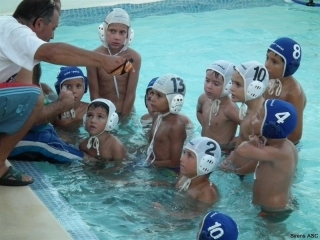 Mini-polo is a smaller, more basic game than water polo itself and has been introduced to teach young players of any age up to about eleven years old the basics of the full game. It is also a great multi-skill activity which teaches the fundamentals of aquatics and sport as a whole, in line with long term athlete development.